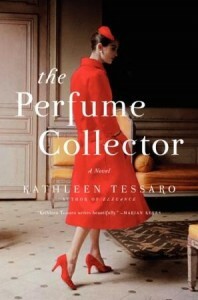 I received a free copy of The Perfume Collector from TLC Book Tours for my honest review. This novel interweaves the stories of Eva D’Orsey and Grace Monroe back and forth in time. Eva is a young girl working in a hotel in New York when she meets a variety of people that will impact her future; Madame Zed and Andre Valmont, perfumers, and “Mr. Lambert”, of the English nobility but currently disowned and on the make. She learns about life and she learns some very hard lessons about people at a young age. Grace Munroe is wife to a thoughtless man who learns she is the sole heir in Eva D’Orsey’s will. Just as she learns of her husband’s infidelity she receives a plane ticket to France and a letter from an attorney. She flies over to learn why this woman left her fortune to her. Of course the reader figures it out quite quickly but as the story bounces back and forth in time Eva’s story unfolds and we learn that things are not as simple as they might seem. I read this book in one sitting – I couldn’t put it down. It captured me from the very first and I was just entranced with both Eva and to a lessor degree Grace. Eva was not perfect by any stretch of the imagination but I think she did the best she could with the situations placed in front of her. She was a highly intelligent woman in a time that did not value intelligence in women – only their ability to be the perfect accent to a man. Ms. Tessaro is one of those authors that writes in a way that makes you forget you are reading; you enter the world of the characters and you do not want to leave. The world around you just disappears and you have found yourself in a place where you see what they see, taste what they eat and in the case of this book, smell the perfume in the air. When you stop reading it’s like you have come out of a trance. These books are few and far between but I’ve been fortunate enough to have now read two in a row from great writers. Lucky me! Disclosure: I received a free copy of The Perfume Collector from TLC Book Tours for my honest review. I received no compensation for this post.